The next big ritual followed during Diwali is that of Laxmi Puja. This is one ritual which is the most integral part of Diwali and the most important too..for obvious reasons. Laxmi Puja is a ritual which worships Godess Laxmi - The Godess of Wealth. The preparation for this ritual starts way before Diwali. It is believed that on the day of Laxmi Puja, Godess Laxmi enters only those premises that are clean and well lit. And that is why, more than Diwali shopping, Indian women are keen about Diwali Safai or Diwali Cleaning. There is also a tradition of playing cards on this day. Legend has it that Godess Parvati had played a game of dice with Lord Shiva, her husband on this auspicious day. She had stated that anyone who gambles on this day will prosper in the upcoming year. 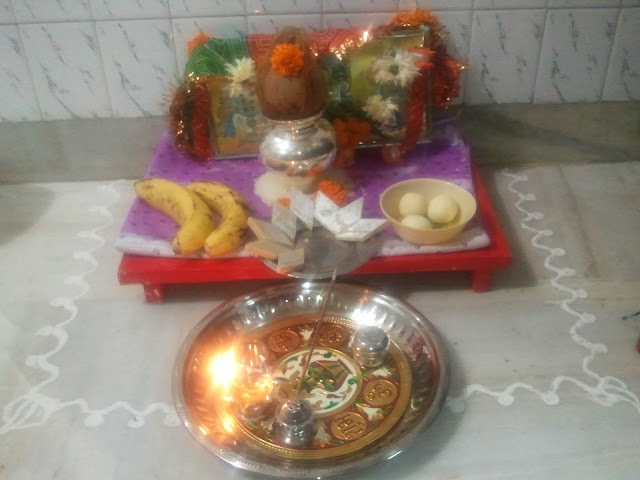 My Laxmi Puja Set Up. Beautiful Laxmi Puja celebration! Hope you had a wonderful Diwali!! Thnks Rosh. U r always too generous wid ur compliments. You are invited to take part in my International giveaway sponsored by Dressale. laxmi puja n footprints of laxmiji is a ritual we follow too ! !